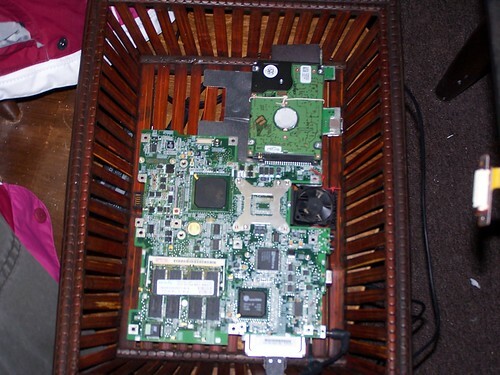 After getting the idea from this blog, I went to Walmart and found a basket to put the laptop board in. The laptop still needs the hard drive ( for now ), so I left that in, but removed the cd-rom and floppy drives. The heatsink was an issue. It has a giant piece of metal stuck to it, that was no longer vital, so I thought about ripping it off, until I realized I didn’t have a good way to attach the motherboard to the basket. I ended up cutting the wire connecting the speakers to the motherboard out, and wrapping them through the basket and around the weird metal piece. I didn’t get a good picture of what I am talking about, but you can see it a little bit in this picture. When I was home for Christmas last year, I collected some old laptops. One of them was being used for jukebox (more on that later), but the rest just sat in the basement of my parent’s house.